Recently, we’ve learned of kitchen accidents that could have easily been prevented with a little awareness. 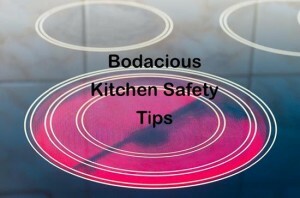 So, we’ve decided to put together weekly tips to help keep everyone safe in the kitchen. Tip #1: Get a fire extinguisher for your kitchen and never ever attempt to put out a grease fire with water! Pouring water on burning grease or oil will not extinguish the fire. It will only cause the burning oil to splash, spreading the grease fire around. Turn off the burner, cover the flame with a metal pot lid or smother it with baking soda. Most of all, remember that 911 is your friend. Tip #2: Get a fire extinguisher for your kitchen but do not store it near the stove or the heater. Tip #3: Avoid wearing inappropriate clothing while cooking. That means loose sleeves and sweaters, and lose bracelets and necklaces that could easily get caught on a cooktop knob or handle of a pan. Yes! It really does happen. Tip #4: Keep dish towels, pot holders and oven mitts away from the stove. They can and will catch on fire if placed too closely to a lit burner, particularly if it’s on a high heat setting. Tip #5: Turn pot handles away from the front of the stove. Children can’t grab them, and adults can’t bump into them if they’re out of the way. Tip #6: Don’t let temperature-sensitive foods sit out in the kitchen. Raw meat, fish, and certain dairy products can spoil quickly, so refrigerate or freeze them right away. Tip #7: Separate raw meat and poultry from other items whenever you use or store them. This precaution avoids cross-contamination of harmful bacteria from one food to another. Tip #8: Learn how to use a knife and treat it with respect. Knives should always be sharp. A dull knife can slip and cut. Learn how to chop and slice as chefs do, holding the food with your non-dominant hand, fingers curled under. Go slow until you are confident, and always pay attention. Tip #9: Place your cutting board on top of a damp towel spread out on your countertop. The towel will prevent your board from slipping while you’re chopping and cutting! Tip #10: Leaving leftovers out for hours or defrosting frozen items on the counter can lead to spoilage and food poisioning. Always keep cold foods at 40 degrees or colder and hot foods at 140 degrees or hotter.